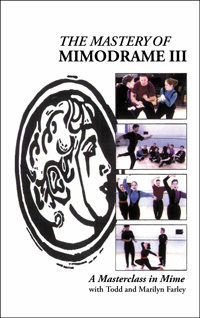 This video contains more advanced mime concepts and techniques taught in a new workshop by the noted mime artists Todd and Marilyn Farley. Filmed in Bath, England, this is the same workshop that they have taught throughout the world. Techniques contained in this video include: Attitudes to create the illusion of joy, courage, and despair; statues, including stacked and linear statues to show the time line from birth to death, and unfolding statues, such as metamorphosis from anger to fear, man to tree, and laughter to crying; and transfer of Concept, including metamorphosis from youth to maturity to old age. Techniques are introduced and explained step by step and shown clearly on the DVD.